Tamahere Fine Foods, the first store in Tamahere’s new shopping centre, is expected to open before Christmas. Owners Satish and Jassie Parmar say the opening date is dependent on obtaining the building consent. In the meantime, the couple, who have a decade of grocery experience, are putting the finishing touches to two years of planning for the store. 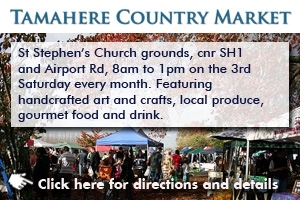 Bliss Bakery and Pete’s Nutbutter sound like a perfect combo for food lovers at this Saturday’s Tamahere Market. Bliss Bakery is a new artisan, gluten-free bakery appearing at Tamahere’s popular monthly market this Saturday, September 15. Pete’s NutButter (peanut butter) is back by popular demand after make an appearance in August. Funding applications are now open for two of the Waikato District Council’s grant funds. The two funds, which support a range of heritage and community projects, are the council’s Heritage Project Fund and its Discretionary Grants Fund. The grants enable community groups to meet local needs and aspirations, said the council’s Chief Operating Officer Tony Whittaker. 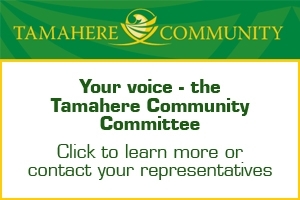 The Tamahere Community Centre annual meeting (AGM) is coming up in late October. A community drop-in session to provide information on impacts locally from the Waikato District Council’s Proposed District Plan is to be held in Tamahere on September 3 and 4. All local landowners will have received a letter about the plan that either detailed the proposed changes to their property or prompted them to view the plan to see if they would like to make a submission. The drop-in sessions are designed for those who have questions about the proposed changes or who plan to make a submission on the proposed plan. Tamahere Forum editor Philippa Stevenson heads to the Solomon Islands early next month to put her journalism skills to use as a Volunteer Service Abroad (VSA) volunteer. Stevenson, who founded and has run Tamahere Forum for 10 years, will spend six months in the Solomons’ capital Honiara as a newsroom and editorial adviser for a small, independent newspaper publisher. The former NZ Herald and Waikato Times journalist said she was thrilled to have the opportunity to volunteer with VSA. Last year fly tippers prompted 746 calls to the Waikato District Council – more than two every day. The illegal dumping of rubbish is such a big and costly problem in the district the council has moved to make it easier for people to report on it. The council has added a Facebook Group to the methods people can use to dump on dodgy dumpers. Disgruntled Tamahere and Matangi readers are going letter in hand to claim their last year of access to Hamilton city libraries. Southern Waikato district residents who are regular users of Hamilton libraries have until September 30 to get a last 12 months of access after the Waikato District Council cut its funding of the long running arrangement. The end of the deal has prompted a storm of protest, a line of grumpy district patrons at Hamilton libraries, and a petition (included) but little response from the district council. By now you’ve probably had some experience with or know someone who has had some experience with Windows 10. Microsoft skipped 9, heading straight from Windows 8 to 10, which makes me think, how does Bill Gates tell time? Does he ever get up at 9am or is that just not an option? It’s probably good that they skipped the 9, mind you, because that might’ve meant they would’ve had to put more time into developing their ideas, instead of giving me something that I have to fix.